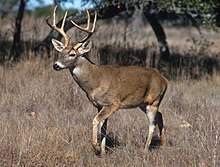 Odocoileus is a genus of medium-sized deer (family Cervidae) containing two species native to the Americas. The name is sometimes spelled odocoeleus; it is from a contraction of the roots odonto- and coelus meaning "hollow-tooth". Odocoileus hemionus Mule deer western half of North America. Odocoileus virginianus White-tailed deer throughout most of the continental United States, southern Canada, Mexico, Central America, and northern portions of South America as far south as Peru and Bolivia. ^ "Fossilworks: Odocoileus salinae". fossilworks.org. ^ Valerius Geist (1998). Deer of the World: Their Evolution, Behaviour, and Ecology. Stackpole Books. ISBN 978-0-8117-0496-0. This page was last edited on 15 April 2019, at 13:07 (UTC).